I’m so in love with Bushy aka Bush Man. No clue where Bush Man came from but Kurt has been calling him that 🙂 He is just the happiest horse and so eager to please. Yesterday, he headed out on his first trail ride. 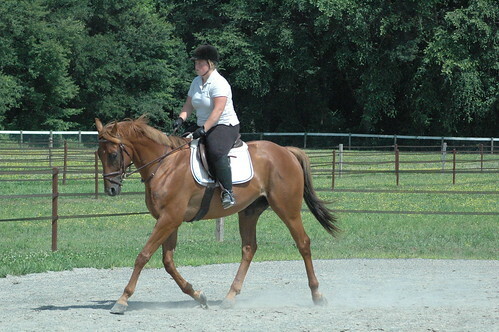 Amy was leading the way on my horse Junior who is the best trail horse and our fearless leader for all the greenies. We hacked out through the woods and then into the open fields. Bushy was completely relaxed and just followed in behind Junior. 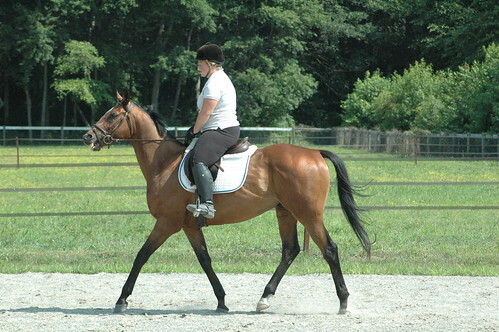 We had a nice little trot across the fields and then I switched positions to lead the way. We were just walking along chatting and I was paying zero attention when huge deer came leaping out of the woods and across the field. What a good man!!!!!!!!! He flicked his ears but almost didn’t even hesitate and just kept on walking. Yep, he is a good one. We had a nice little trot around and then switched places for a canter and he just cantered along very casually not even taking up contact which is very good. Just sat really soft in the hand and was very balanced. 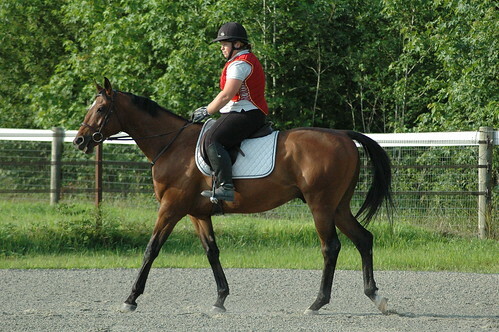 We cantered the whole length of one of the fields and I could have ridden that canter for miles. We have gotten several horses donated from the same trainer and they have all been super well broke but what I would call stand offish on the ground. They are not sure of humans but they eventually warm up. 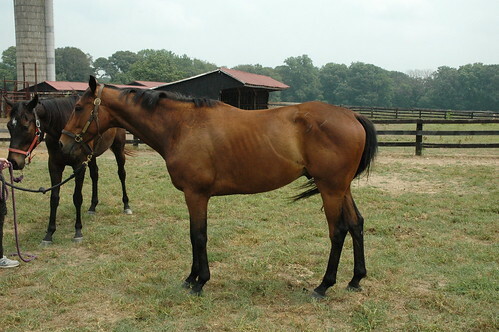 Letterman’s Humor is a classy stakes winner who ran 57 races making over $168k. He is now 9yrs old and just starting his second career but he is very much like Bushy in that he knows his job and is totally game for whatever you ask. I would say he is just slow to trust but being in a small barn with the same people handling him and a daily routine he is warming up to me. He loved Pat over at the layup farm but each time I tried to catch him he laughed in my face 🙂 Even now I still either have a halter or fly mask on him but honestly we are almost there. It makes a big difference when they come in for grain twice a day and get to stand in with their fans on each day. I go in and chat with him every morning before work while he is eating. Just scratching him behind his ears and letting him know that he is loved. Tonight was his first ride and he was excellent. I expected him to be good because a horse doesn’t run for 6 yrs on the track and not know what the deal is when it comes to riding but he was very relaxed and happy. The first rides are very much at their own pace. I try to just stay out the way and let them go however they want. Very short and sweet type of rides just to feel them out. I don’t pressure them for anything at this stage. If they run into the canter no biggie. I always have the neck strap and just hold on to it because you don’t want to pull back as forward is the right answer for them. I try to stay up and out of their way as much as possible. He totally cracked me up doing the lead change to his left lead! Amy was riding Bushy at the same time and they both seemed cool with other horses in the ring. I think Letterman just has the “look” about him. He is one freakishly smart horse. In other news, I sadly took Mort back to the layup farm yesterday. He needs some time to rest that stifle and the right thing to do is turn him out. 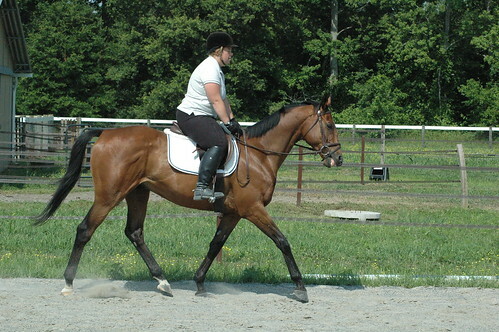 I brought back Rockin Fun and I am excited to get him started. I am totally going to sell some horses 🙂 Ha, if I keep saying it then it will come true but Letterman and Bushy have been at the farm since Sept of 2010 simply because we haven’t gotten to them yet. They both really want to have their own people. 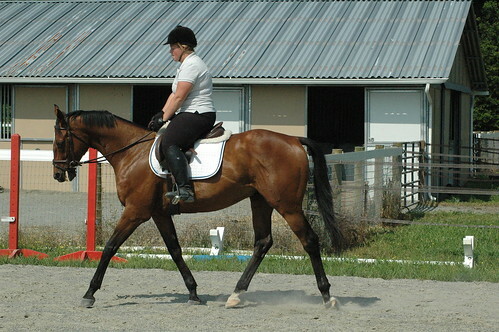 I really try to address the issue of contact as soon as I feel the horse is ready because I believe that the horse needs to learn to come over the back in order to muscle correctly and they have to relax the back, neck and jaw to go forward properly. He was really thinking though and I was gentle but persistent that I would keep the contact when he went to the giraffe mode. As soon as he softened then I would soften. 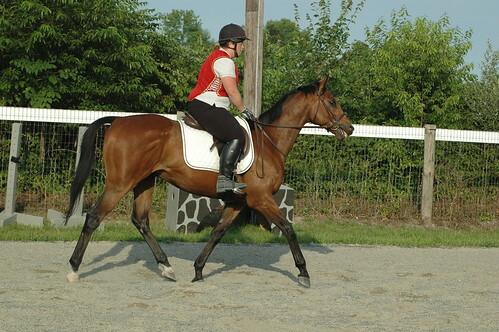 It is just amazing how different they feel when the back relaxes just a little bit and then when you really get them to drop the neck and stretch you can almost add another foot onto the stride. I also worked his left side which is his stiffer side getting him to relax and bend but that was still hard and will be a work in progress. We did get a left lead which was excellent. Isn’t that a drastic difference in just one week? I also rode Mort two days in a row. He is coming back from straining his stifle. He feels much better but will need to build himself up a bit more. I can feel the ouch in the canter still. Look at how much he has filled out! He is such a lovely horse. 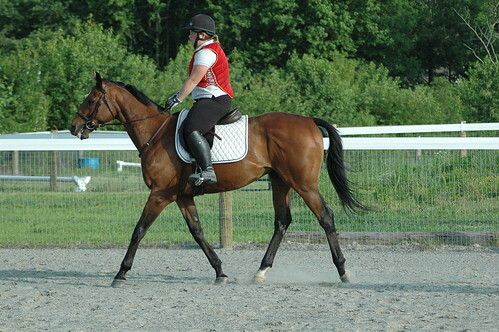 I am so happy to be back on him. One of my favorites to ride as he just has such a great feel about him. I am hoping to get on Letterman tonight. He cut his knee and has some swelling but it has healed up and he is past the ouchy stage. The boys play very hard! Keeping them sound during bug season is quite difficult. I haven’t gotten as much done with the new horses as I have wanted to but it has been a bit of a transition period for them so sometimes it’s best to just let them settle and now they are good to go. I also am temporarily housing a breeding stallion..long story but doing a favor because I could help some good people out. 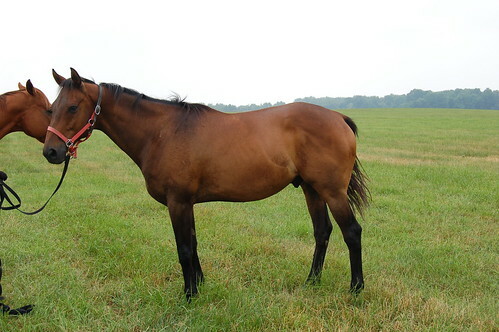 Adding a stallion to the farm has been some creative management but he is a very cool 10yr TB that has lovely breeding and is a super classy animal. He was rescued and is now getting evaluated to see what his future will hold. Mort, Bushy, Letterman and Bratty Buck are all turned out together and watching them all play will keep you entertained. Mort and Bushy are absolutely hilarious! Bushy had already been to my farm in April for a week or so when somebody was supposed to try him and then ended up not showing. 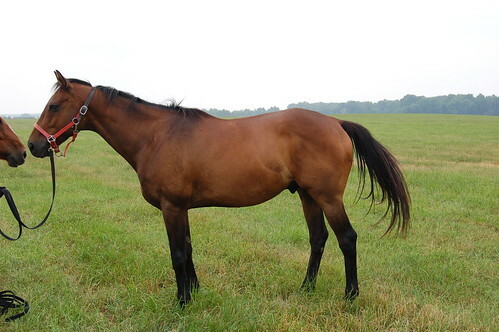 He is such a sweetie and a true war horse who ran 59 races and made over $130k. He is only a 7yr! 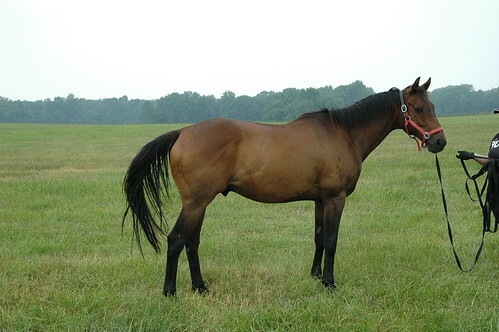 Personally, I love an older horse because they have been there and done that. He marches in the ring and just goes around like he knows the drill. 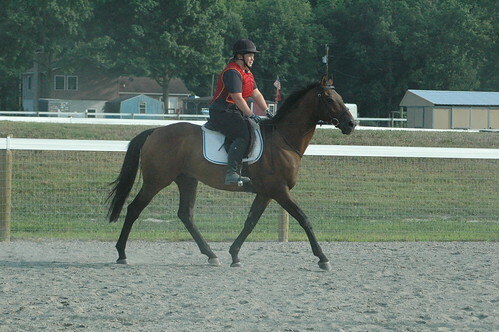 I stuck him on the lunge line and he was good about that and then we had a little w/t/c around. No real agenda just test out all the gears. 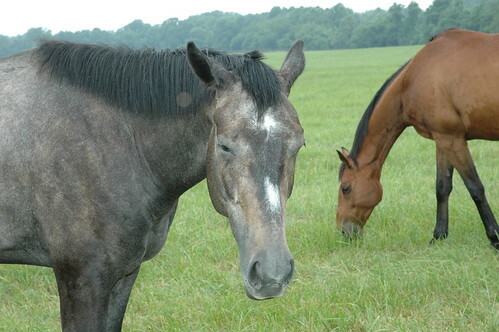 He seems like a happy go lucky type of horse. 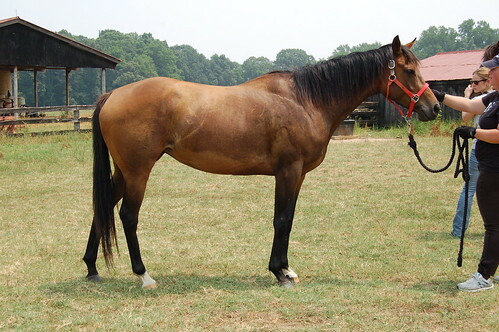 I hate to say but these older guys can be harder to sell and he is only 15.2 so I have my work cut out for me but I am a believer in these types so I know I can find him a good home. Remember how I said that I was slowing down???? Ha, today there will be 8 horses in my barn. Hopefully, two are headed to the big farm very soon so they are just staying for a short period of time. I had went over and brought Letterman’s Humor and Bushy’s Yield back with me. I have gotten as far as pulling manes, giving baths, clipping them up and putting on fly sheets. They have settled in nicely to the program. Since the arrived I have been absolutely crazy busy with other emergency situations. I was supposed to meet the vet to have Mort’s stifle injected on Monday. He is much better but we are just providing him some relief with the injection to help everything quiet down. 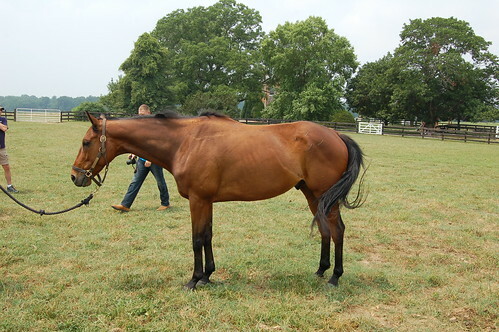 I had to change that plan as we got a call on Monday from another TB rescue that there was a Delaware Park horse at the sale and could we see if we knew him. 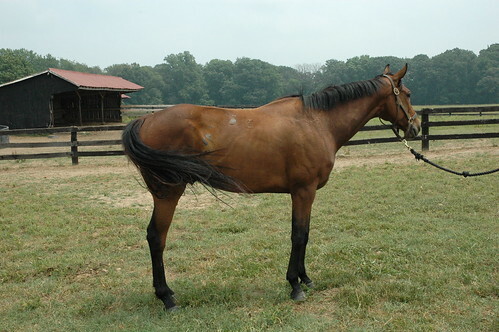 I did know of the horse and we will be receiving funds from Delaware Park this year so we went ahead and bought him. I had to head home to meet the shipper. 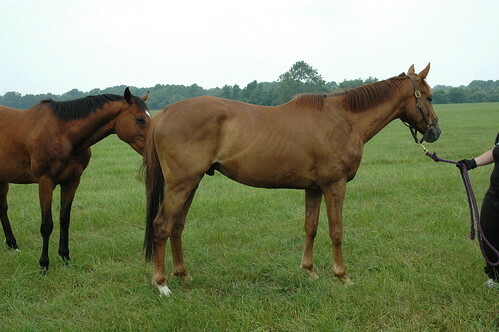 He settled in great and other than being thirsty he is in super condition. My phone has been ringing off the hook this week for CANTER related matters. We have periods that tend to be like this but it can get overwhelming especially on top of my regular job and life on the farm. 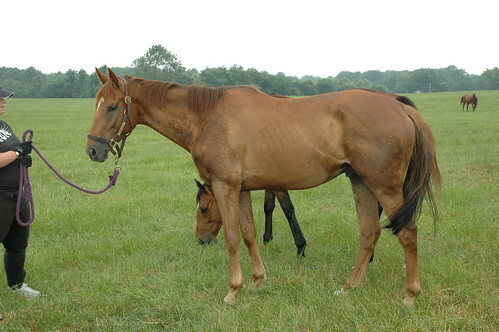 Yesterday, I got a call that one of former CANTER horses needs to be returned due to time constraints with her owner. 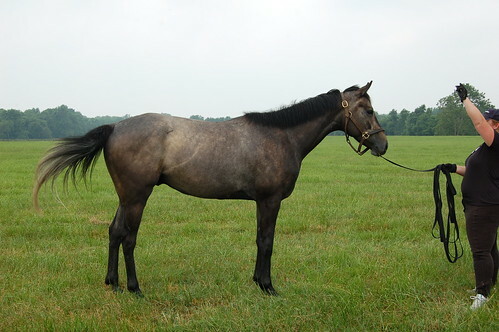 Her name is Escape by Sea and she is an absolutely lovely mare so she will more than likely be standing in my barn today when I get home. 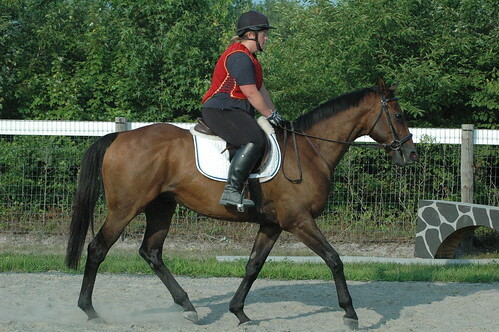 One of the really great things about buying a horse from CANTER is that we will take them back. I literally said sure just drop her off and stick her in a stall. 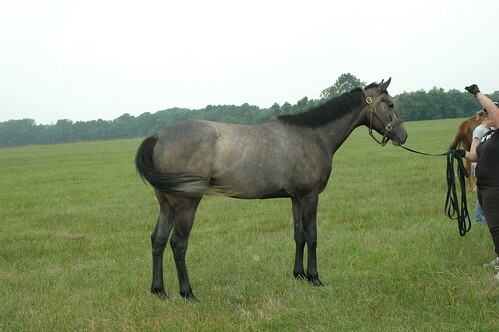 We also had another horse returned this week also due to time constraints. Sea Flip who was one of my absolute favorites is now down in North Carolina. 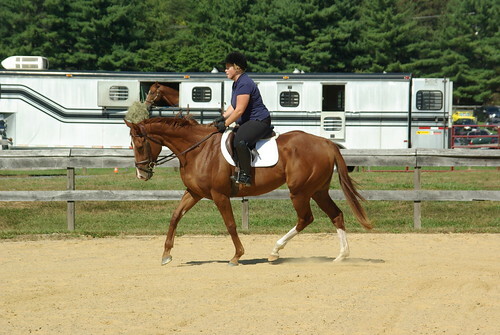 I was told Suzanne has already hopped on him and declared him very cool…no surprise there! I understand people getting busy and not having enough time or money to campaign the horses and feeling guilty that the horses are just standing around. I had to dig out a hilarious picture of Escape by Sea. 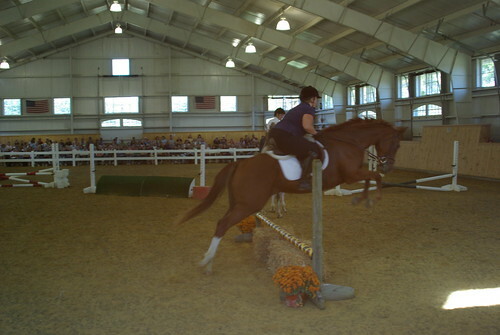 We were asked to ride in the retired racehorse symposium in a very packed indoor. 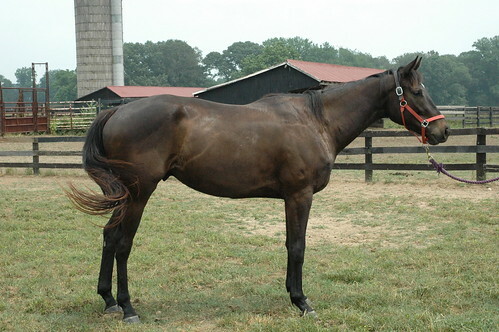 Bella was only recently off the track, had never been off the farm and had just started over fences. Sounds like a recipe for success, doesn’t it? I knew she would be just fine and sure enough she marched around that indoor. My friend Alison was riding her recently off the track 12yr tb, Top Punch so it was a cool contrast of horses recently off the track but very different ages. Steuart Pittman kept asking us to jump and this mare had never seen more than an x-rail. 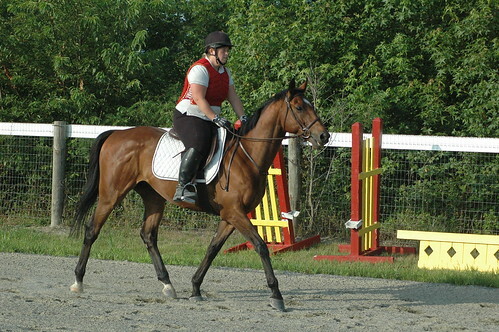 I had a very careful position because of this type of jump that I knew she could do! See that rolltop right heading toward the crowd? Well she jumped the living daylights out of that as well and scared herself a bit. I am sure I looked horrible but better to stay on sometimes than worry about looking pretty. Everyone helped to take pictures and these are some that Shannon got which are better than what we captured. Off to go evaluate Letterman. 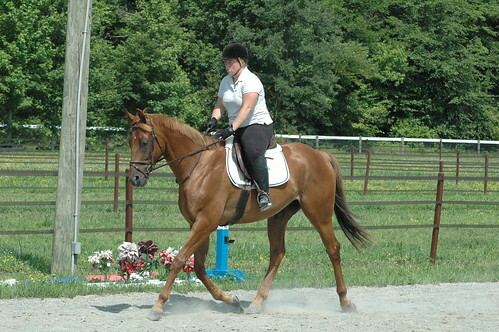 I have ridden Bushy before and he is a super sweet awesome guy. Letterman will be a project but I can bet he is super smart and should be just fine! We have horses on the farm that our director hasn’t even seen yet which I find pretty funny 🙂 Today we headed out to capture them on film and video which is quite the adventure. So very thankful to have the help of Lauren, Shannon, Randy, Mikaela and of course my hubby. 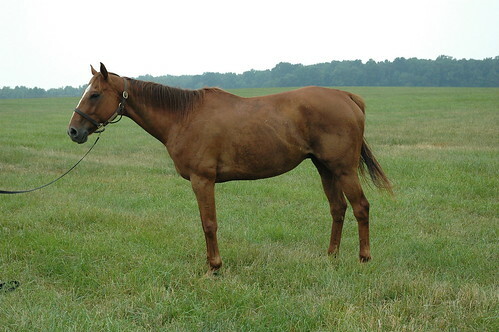 Have you ever tried lunging horses in huge open fields? 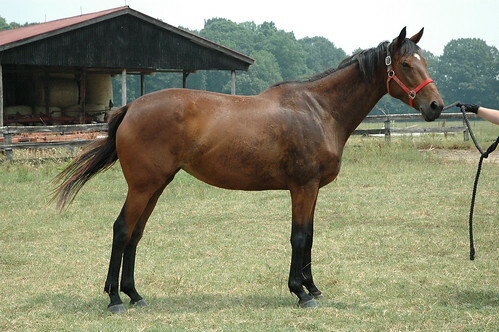 Horses that don’t know how to lunge and think you are the devil? Well it makes for an interesting day. It’s a good way for me to get a read on their personality and movement before bringing them to the retraining facilities. We started out in one field and did some pictures and video there. Remember Rockin Fun from the earlier blog post? He is a lovely 6yr and has been at the farm for a few weeks. Wouldn’t even recognize him. Bleached out and losing weight and muscle and he transitions from track to farm. Next up was Luke’s Notion. 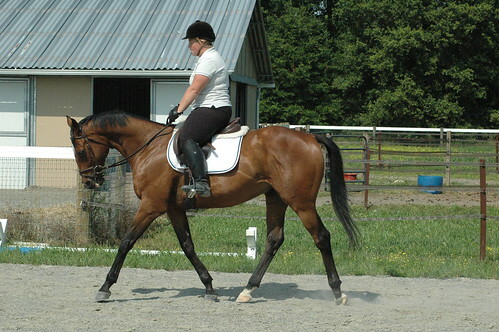 He is a big 16.2 h and growing 3yr that never raced. He is in the long and lanky stage for sure! I wanted to check out the new horses so we headed over to the other field. The two new guys are super friendly and came right up. This is Hold that Halo also another big growing 3yr who is about 16h or so. He has lost a bit of condition since arrival due to the challenges of fitting into a new group and 100+ degree weather. I think he will be okay in a few more weeks but the transition period can just be a bit tougher on some. Cyber Gray Vette arrived with Halo and they are best buddies. He was very tired from all the recent hot weather. It was cooler today but the humdity and sun still made it feel quite hot. 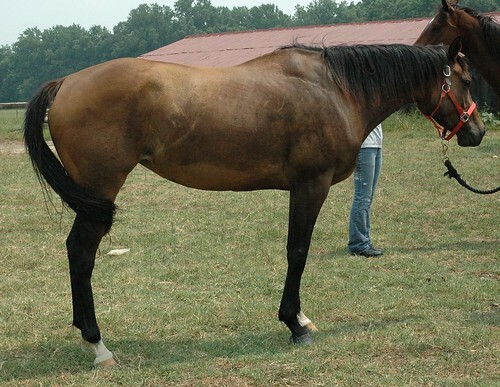 Excuse the really large halter. We grabbed two halters to take out and the one was for Pegagus Fever and he has a huge head. 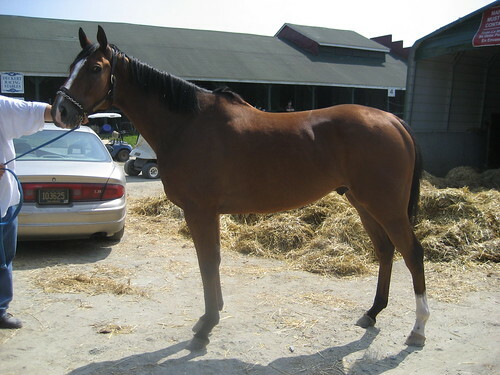 Next up is Letterman’s Humor who is a super cool now 9yr graded stakes winner. 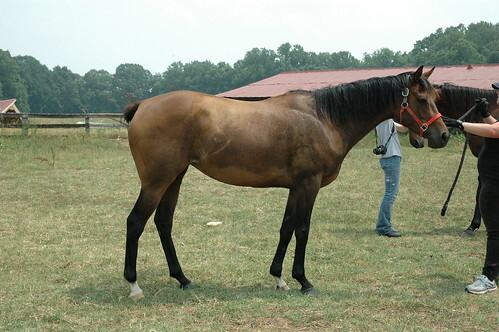 He kicked around the track for a long time and came to us in September of 2010 and has just been hanging out. He has gotten a bit feral since arrival and this was the first time I could actually halter him thanks to having help. 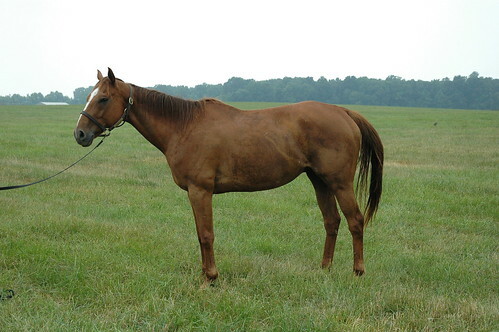 Rusty Should Run is a 7yr who is just the sweetest boy you could ask for. We finished in that field and decided that since we had the halter on Letterman he was coming home with me and we brought Bushy’s Yield as well who we didn’t get pics of. I stuck them on the trailer for the last hour or so of our visit. Letterman=not happy but Bushy was very chill about it all. We went to visit the mares. 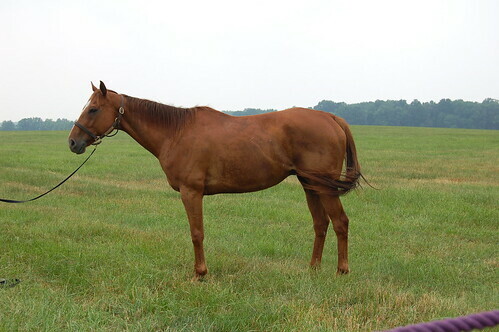 We only have two mares on the farm right now that belong to CANTER. 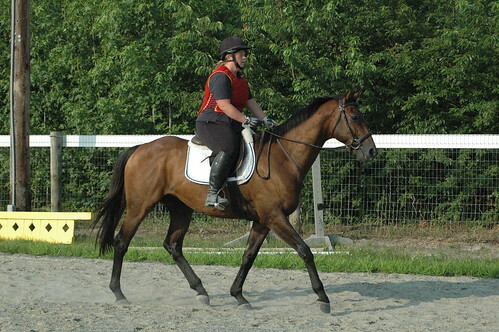 Devon O Seven is a big 4yr mare who is quite the tank. 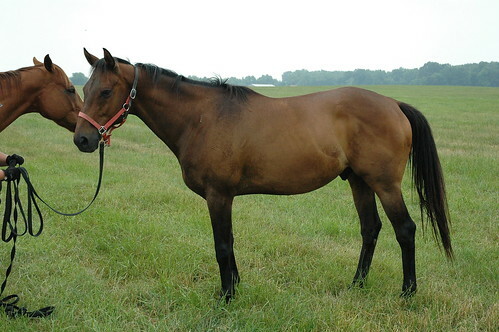 Wonderful Wise is a dainty cute little 5yr mare who wants to be a little hunter pony. Here is the video of all of them so be patient if you want to see them all. Luke’s Notion being ridden. He probably hasn’t been ridden since sometime last year at the track. He was a really good boy! Please keep in mind that the horses are barefoot and the ground is currently concrete. 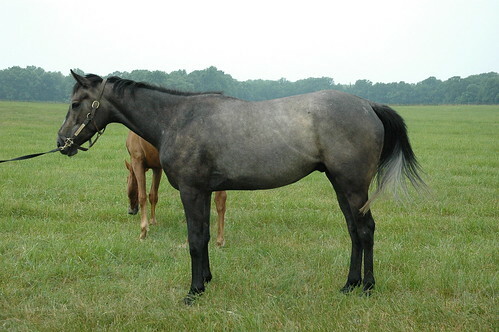 The most recent horses (rockin fun, cyber gray vette and Hold that Halo) got shoes pulled recently and are very foot sore. 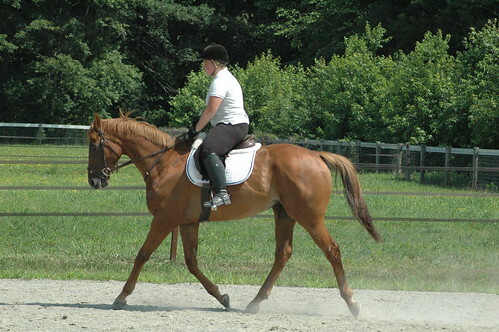 Rusty also has flatter feet and is ouchy on the hard ground. As we drove home we hit some wicked storms with heavy rain but it wasn’t raining at our house. I got Letterman and Bushy in the barn and into a small paddock with their attached stalls right before the storm got to us. Kurt and I had to hang out in the barn for a while until the rain let up. We were happy to see the rain. The ground is so hard here and it has been so hot. It was a welcome sight.